Meisterin Christian and Dona Isabel Maria wrote this article for FTT - it meets the categories An Essay Of A Thousand Words and Those Who Can Also Teach. 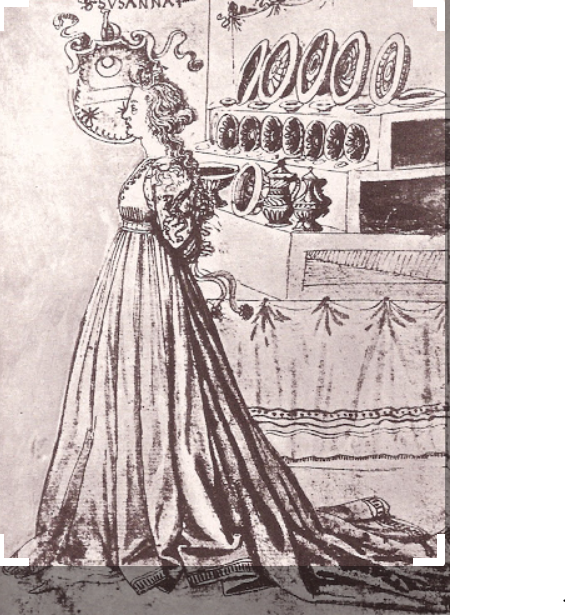 We decided to write this article because several people asked about the cupboard and baldequin that we put together as part of the decorations at Baronial Anniversary 2017, and we wanted to provide some background and period examples. We hope we can show that the arts and sciences can also support the service / stewarding aspects of our society, and we encourage stewards to do a little research to find ways in which they can enhance their events in a more period fashion. 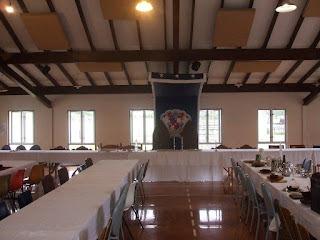 This article is to give you a little historical background to a couple of hall decorating 'touches' we have used (most recently at Baronial Anniversary 2017). Members of our household had volunteered to steward the event, so as is our custom we looked for ways to support them in that task. We decided that we'd like to tackle the hall decoration, as between our camping gear and event stewarding kits, we had enough "schmutter" (thanks to Baron Oswyn for the word "schmutter" meaning ‘all that cool stuff in the background that enhances the period feel and atmosphere’) such as curtains, chandeliers, candle lanterns, and so on readily available to dress the hall. While it takes a fair bit of work to fully decorate a hall (and we'd like to extend our profound thanks to everyone who helped put up and take down the decorations), we believe it’s worth the effort to try and capture the period ambience of the kind of world we strive to recreate in the SCA; in this case, a late period Italian noble’s feast hall. We also appreciate the kind words of all those who enjoyed the hall dressings. The hall at Baronial Anniversary this year (Rimu Park) is a tough customer. No matter the decoration, it’s hard to miss the underlying "airplane hangar" construction, and in summer the glazed roof lets in too much light for candles to be really effective. On the positive side there are plenty of structures from which to hang e.g. the chandeliers and banners, and the side alcoves can be curtained off to create more intimate areas. The hall was missing some tables this time so that did make the design a little more challenging than usual and meant we were not able to complete everything we had planned. 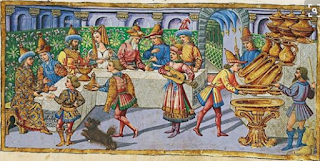 Period illuminations and paintings provide a rich source for researching information about decorations for feast halls. While it is important to treat, especially illuminations, with some caution, the frequent appearance of similar decorations and types of furniture, and in some cases their concordance with extant or later pieces, suggests there are some useful conclusions we can draw from such sources. 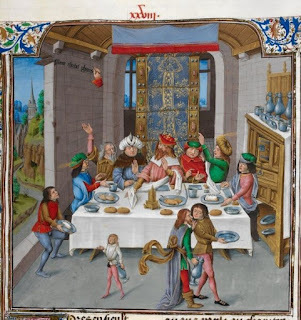 A range of 14th to 16th century illustrations featuring feasting scenes can be found below. 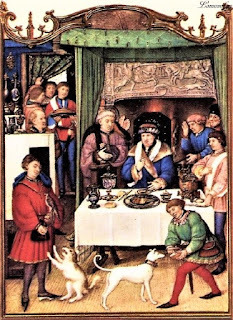 The two particular features of decoration we'd like to focus on in this article are the baldachin / baldequin and the "cupboard". 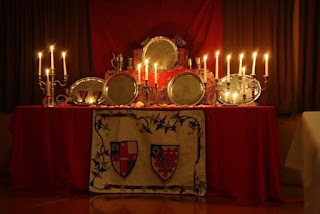 We have used these before at feasts and events, and we'd like to share a little information about period examples, and suggestions for their recreation in the SCA. The baldachin / baldequin was the canopy that hung over and behind Their Excellencies at the high table at Baronial Anniversary 2017. You may have seen this at other events, including for example hanging over Their Majesties at 12th Night Coronation Feast (Canterbury Faire) in 2016 (see below). The baldachin / baldequin at the Feast at 12th Night / Canterbury Faire 2016. The baldachin / baldequin at the Feast of Saint Percival in 2009. In period a baldachin / baldequin (or canopy of state, or cloth of honour) was a ceremonial canopy that was placed over a throne or high table etc as a symbol of authority and status of those who sat beneath. The canopy was most often made of fine fabric (for example see Figure 1 below; the name baldachin / baldequin is derived from the term for a particular luxurious type of fabric) but later could also be made of various more permanent materials. 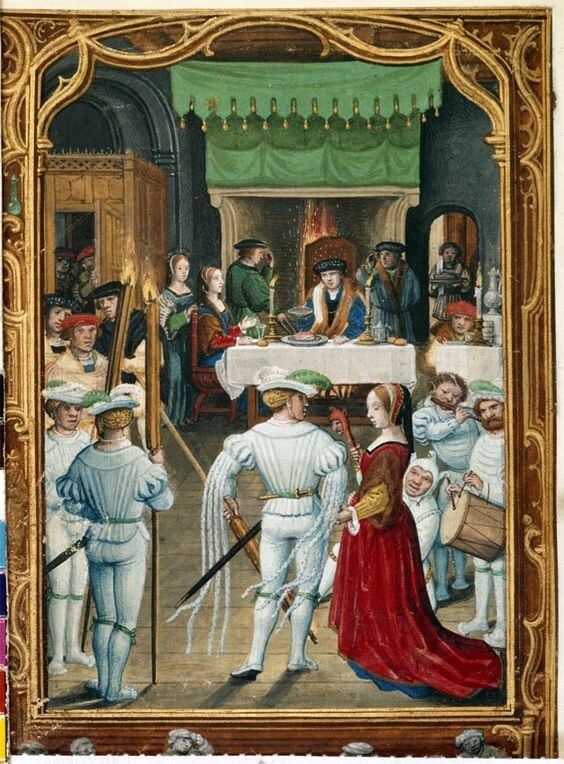 Canopies might also be mobile and carried above important personages during processions (as was the case for Baron Sigurd and Baroness Eleonora at their investiture as Baron and Baroness Southron Gaard). Of particular interest here are the baldachin / baldequin fabric canopies used in feast halls. A number of period illustrations featuring a range of styles of baldachin / baldequin can be seen at the end of this article. These canopies were placed over the highest ranking person(s) at the high table, and comprised a 'roof', and 'wall(s)' that usually fell behind the thrones or chairs. The roof often, but not always, had a ‘valence’ around the edge (for example, Figure 2). These canopies most often appear to be made of fabric, and can be decorated with heraldic elements (heraldic colours or motifs) such as those in Figures 2 and 7 below. How the canopy was suspended is not always clear from the illustrations; some appear to be suspended from above (for example, Figures 1 and 3), others appear to be free-standing with supports that are not visible (for example Figures 2, 6 and 8). In a smaller number of illustrations an architectural framework frames or supports the canopy (for example Figures 5 and 10). The baldachin / baldequin helps bring the focus of attention in the room to the high table, and marks out and orients the room to the Royals or the Baron and Baroness. 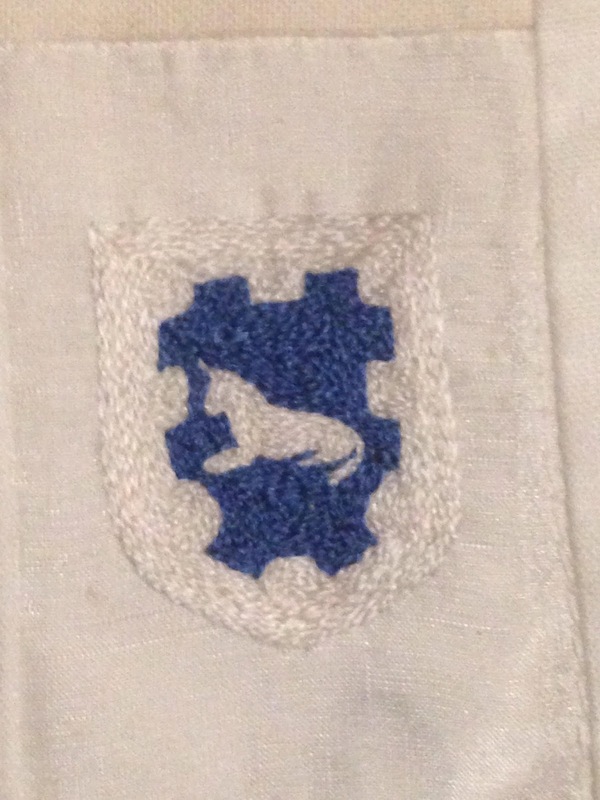 A sumptuous fabric and / or heraldic decoration can enhance the display. The canopy also has the advantage of reducing breezes on the back of the thrones, delineating “Royal Presence”, and hiding all manner of poor hall architecture (or modern decoration) as well as practical bits and pieces behind the throne. The "cupboard" we refer to here is the table or cabinet-top display of fine plates and other metal vessels (which I will refer to here as “fine plate”) that stood by the door at Baronial Anniversary. You will have seen several of these that we have done before at previous events. See below for two event photographs. The “cupboard” at a previous Baronial Anniversary. The “cupboard” at Baronial Anniversary 2017. The period names for this and similar types of furniture are somewhat unclear. Looking at illustrations of period feasts it’s possible to see a number of different types of shelving or cupboards in feast halls; for example a cupboard with doors (usually described as an ambry), a cupboard from upon which it appears wine was served, the cupboard / table display of fine plate, open shelving units of various kinds, etc. Our focus is on this display of fine plate. 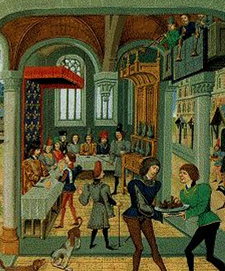 These “cupboards” do not appear to have a functional aspect at the feast; food or drink is not served from them as we might serve from a ‘buffet’ today. 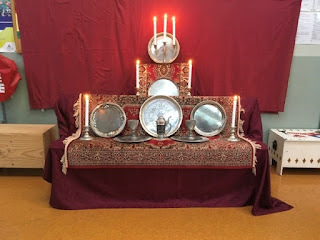 The display of wealth and status through the display of expensive metal ware (which is not used for feast service but is only for display) is the key to this piece. 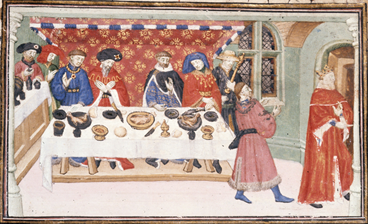 These pieces of furniture have a number configurations and structures throughout time and space, but common elements include a cloth covering the cupboard or shelves (for example Figures 1, 8, 10) and placed upon that a tiered display of fine plate (gold or silver (or perhaps even pewter) plates, dishes and other vessels; for example, Figures 1,2 8-12). Some “cupboards” even have a little wooden or fabric canopy over the top (for example Figures 2 and 8). A number of period illustrations featuring a range of styles of the cupboard display can be seen at the end of this article. Carrying about a large purpose-built wooden cupboard is impractical for SCA events, and even our nicest halls have not had furniture that could lend itself to this treatment. We have therefore used a variety of tables, cupboards, boxes and shelf combinations to construct our cupboards, often cobbled together underneath with clips and tape. The unexpected lack of tables at Baronial Anniversary meant we had to be a little inventive in our construction this year. Baron Richard was also kind enough to make a wooden table top unit for this purpose. Fine cloths (we have used white linen, brocades, and carpet rugs) can add richness to the display, as well as hide an underlying non-period structure. The "plate" comes from our personal feast and camping gear collections; sometimes we use silver tones, sometimes gold tones, and sometimes both. Some of the plates are in pretty rough condition, yet look good at a distance and under candle light. 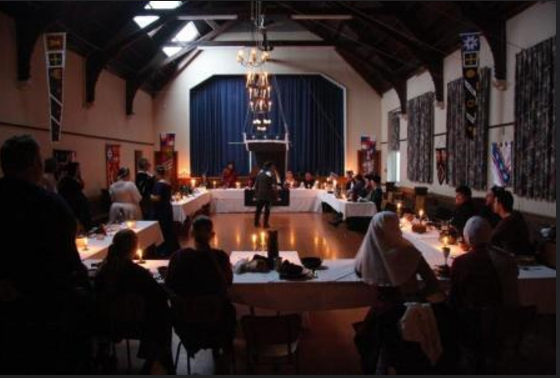 While other items aren’t generally seen on “cupboards” in period illustrations, we've used small items that work with the theme of the event, and also candles to help light and bring sparkle to the plate in halls where otherwise we have insufficient period lighting to illuminate such a display. The "cupboard" is completely decorative and non-functional, but it is a large, strikingly non-modern, decorative element that takes reasonably minimal effort and brings period ambience to your hall. 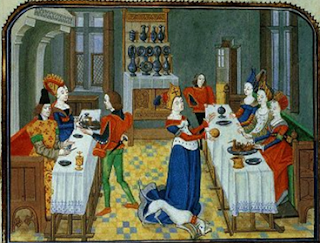 Both these decorative traditions persist even today in some royal palaces. 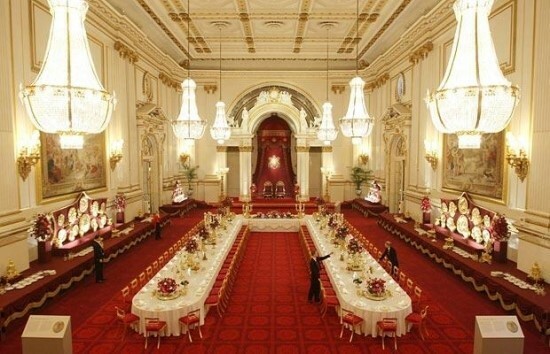 Note Figure 13 below from a recent state banquet at Buckingham Palace where a baldachin / baldequin hangs over the thrones, and cupboards displaying golden plate are placed on either side of the hall. We'd like to encourage other stewards to take the opportunity to do a little research and find similar interesting period (decorative) ideas for enhancing their events. We’d also like to encourage the populace to contribute to the period ambience of events; by bringing personal banners, dressing or decorating their tables, bringing candles and other lighting, and so on. 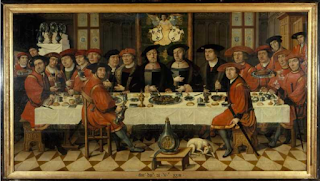 There are a number of categories in the Baronial Arts and Sciences Challenge that would provide some excellent scope for researching and recreating such items. 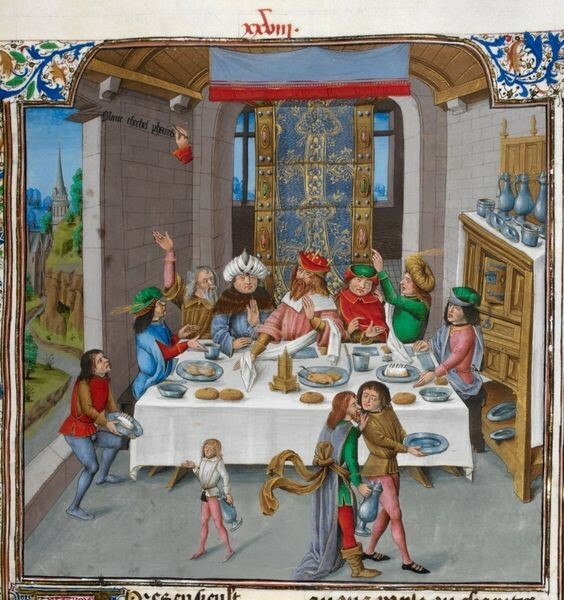 For more period examples, you might see our Pinterest pages https://nz.pinterest.com/amberherthe/ (especially those on Table Settings, Tableware, Houses & Houseware, Lighting, and Wall Hangings and Decorations) for illustrations, ideas and inspiration. Figure 1. 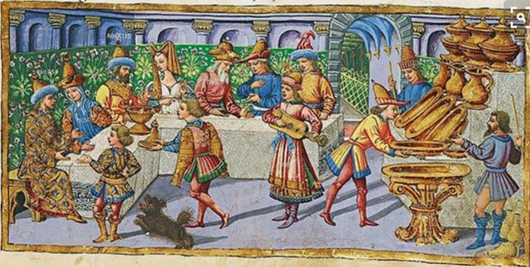 Italy, 15thC. Canopy has elaborate brocade at the back and the front drop is trimmed with a fringe(?). Cupboard with cloth and silver / pewter vessels, on the right. Figure 2. French, 15thC. Heraldic fabric back trimmed in red with red fringed canopy. Cupboard with canopy on the right. Figure 3. English (? ), 16thC. Elaborately dagged and tasseled baldachin, with back dropped suspended (?) 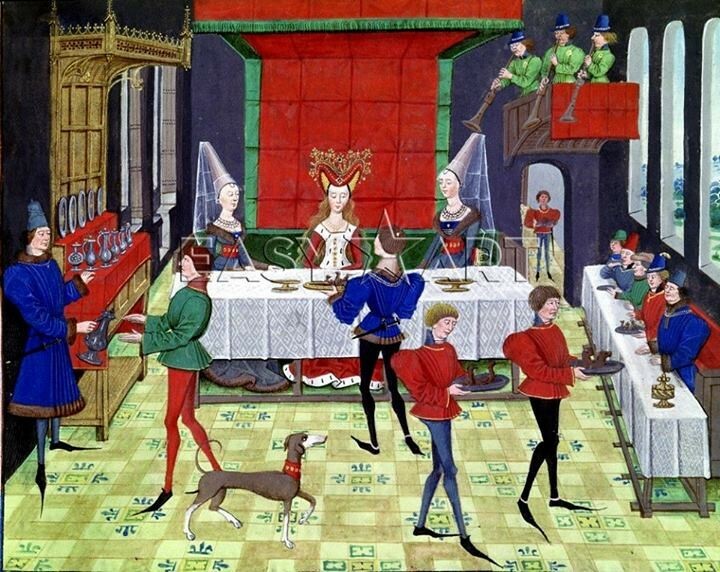 to allow the heat of the fire through to the high table in winter. Figure 4. Italian, 15th. The baldachin has a tassled (?) roof, and in this case sides rather than a back, perhaps to take advantage of the heat from the fire. Cupboard (with fabric canopy?) on the left. Figure 5. France, early 15th C. The baldequin has an architectural frame with various fabric drapery. Figure 6. French, 1420. A brocade baldequin with a particoloured fringe. Figure 7. French, 14th C. Three separate hangings with French heraldic motifs. Figure 8. 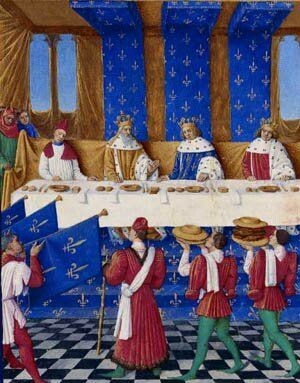 French 15thC. Red baldequin with green trim and fringe. Cupboard on the left (with it’s own built-in canopy). Figure 9. Florence, 1460. The cupboard 'shelves' are hollow 'boxes', and the front and wall behind are covered with draped cloths. A mixture of dishes and jugs are placed on the board. Figure 10. French, 15thC. Cupboard in the middle background, the cabinet covered in a white cloth with vessels also on 'shelves' above. Architectural ‘canopy’ over the table on the left. Figure 11. Florence, mid 15thC. The cupboard is covered in the same cloth as the feast table, and contains tiers of plates and jugs. Figure 12. Antwerp, 1523. The cupboard in back left is covered in a white cloth with tiers of plate and jugs. Figure 13. 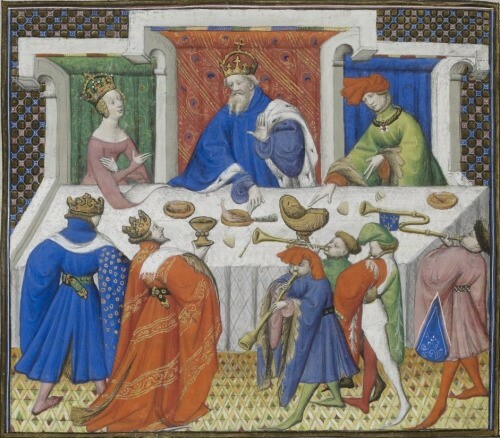 Recent state banquet at Buckingham Palace with baldachin / baldequin over the thrones and the cupboards displaying golden plates etc on both sides of the hall. 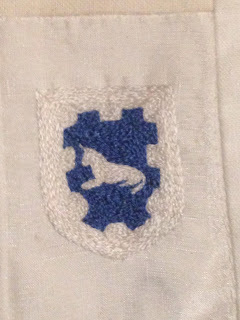 This delightful piece of embroidery from Her Excellency Ginevra is for the categories Here Be Monsters, Show Us Your Arms, and Give What You Get. It is worked with silk thread, on silk, in split stitch (with thanks to Melissa for teaching me) and is 1.5 inches high. It's been given to Mistress Rowan, to be part of the Broiderers Guild of Lochac Banner.